I have recently added some items to my TPT store and while doing that, I needed to update the downloads. These printables started out to just be the file folder game with new graphics, but as I worked on them, I came up with all new ideas! So, that led to a new blog post to share them here. And, I just found another new set of graphics, so I will think of more ideas! Maybe, some projects with these. I started by creating the file folder game with the new graphics. Click here to see the original Birth of Jesus FFG. 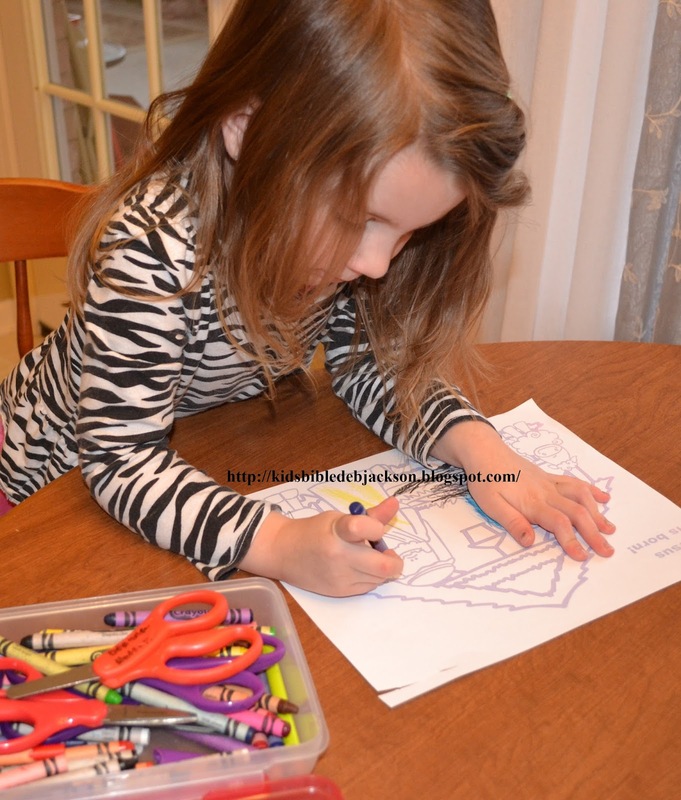 But, I had the different backgrounds and kids love to flip and turn, so I added a couple extra backgrounds. 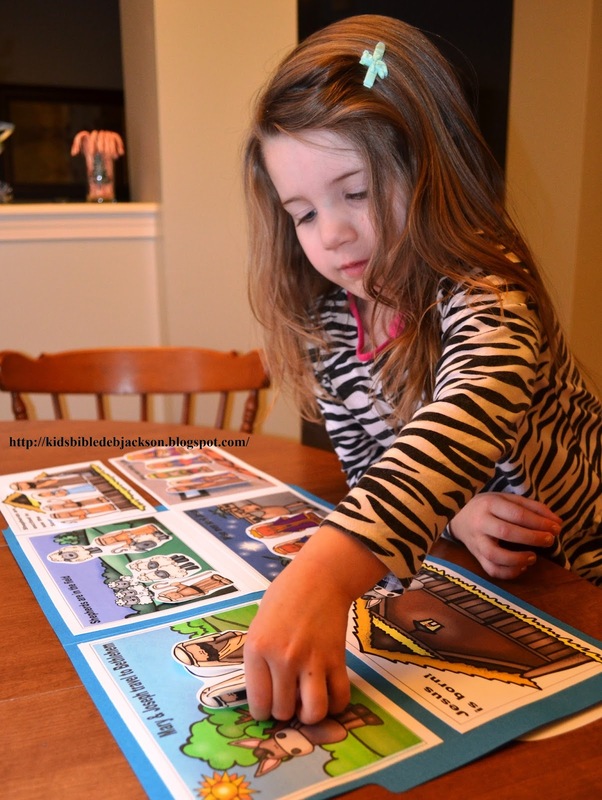 The kids can tell you the Bible facts while they add the extras to each background. There is a visual of Mary & Joseph on their way to Bethlehem. Then, Jesus in the manger. The shepherds are in the field and then they are excited to see Jesus. When Jesus was about 1 1/2 to 2 years old, the wise men visited Him. The Bible states in Luke 2:12 that the angel from God told the shepherds that the Babe has been born. We are told in Matthew 2:1-11, when the wise men visit, that Jesus is a young Child. The top left photo is the front of the file folder including the tab placement. The top right show how I used packing tape to connect the two sets of backgrounds. After I taped them (leaving a slight space between them), I glued them to the file folder. Now they can be flipped open. The bottom photo shows the inside complete. Click here to download the FFG. Since I had the background scenes all in place to make sure everything was sized correctly, I decided to add these as visual aids. See how one thing leads to another? 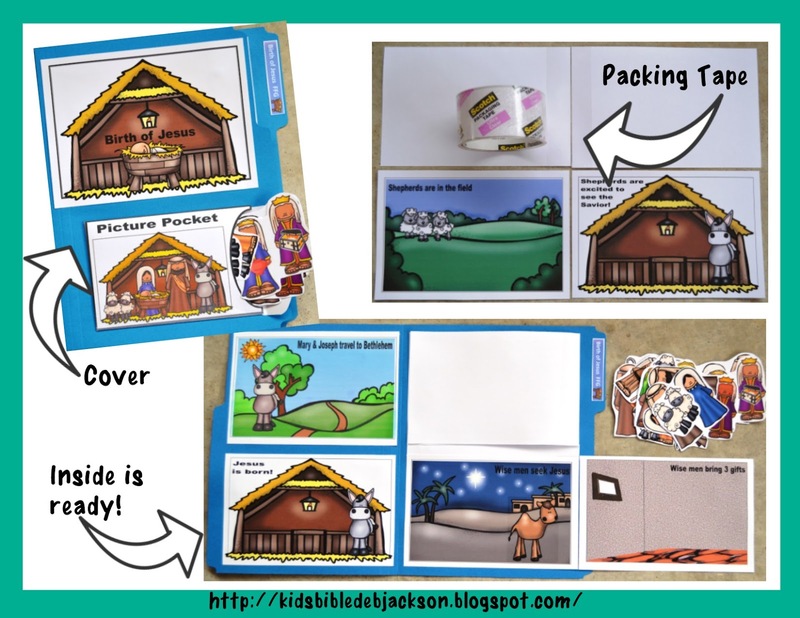 These can be used as visual aids to tell the lesson, or they can be put together and be used as a book. Or, they can be used to put the facts in order. Click here to download the visuals. I also created a matching set of pictures to color. You can use them separately, or put them together for a book. These are full pages to print and only the black and white are available in this download. Click here to download them. Thank you for the comment! I am glad you can use this. She has had a lot of fun using it. Thanks for stopping by!